I seriously love this dress! I'm so happy the pictures came out so vibrant. I feel so flirty, girly and oh so twirly in this dress. It's comfortable and light that you forget sometimes you even have clothes on! Whats your favorite dress that makes you feel amazing? I'd love to hear! So so so cute! I've had my eye on this dress! What gorgeous pictures, really convey the joy of summer! I've posted recently about my perfect cocktail dress that I wore to dinner with Tom Ford, although I love just as much a floaty easy number for daytime. I love the dress and the tulips. These are lovely pictures. Thank you for sharing! You look as fresh as a Summer day in that dress!! 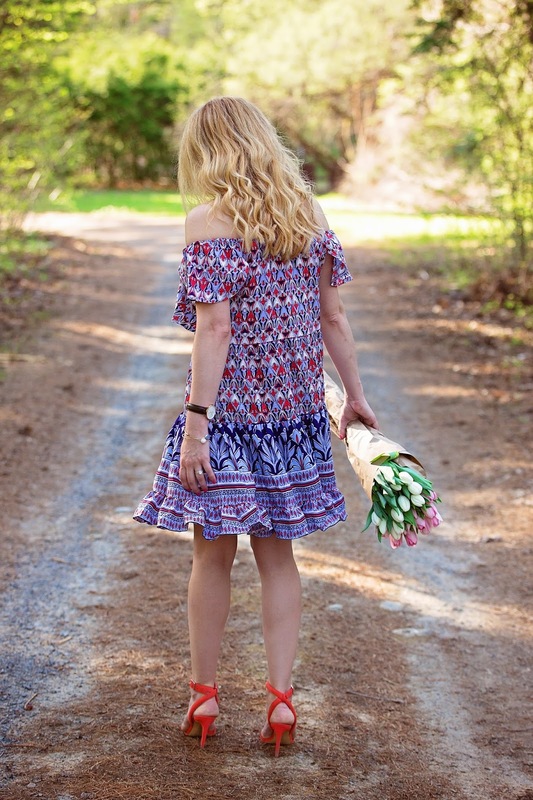 Pretty dress, flowers, and photos! Omg this dress is absolutely stunning! I love this look! What a beautiful photo shoot! The dress, flowers, you... perfection! Beautiful dress, and those shoes are awesome! I lovve this whole outfit! 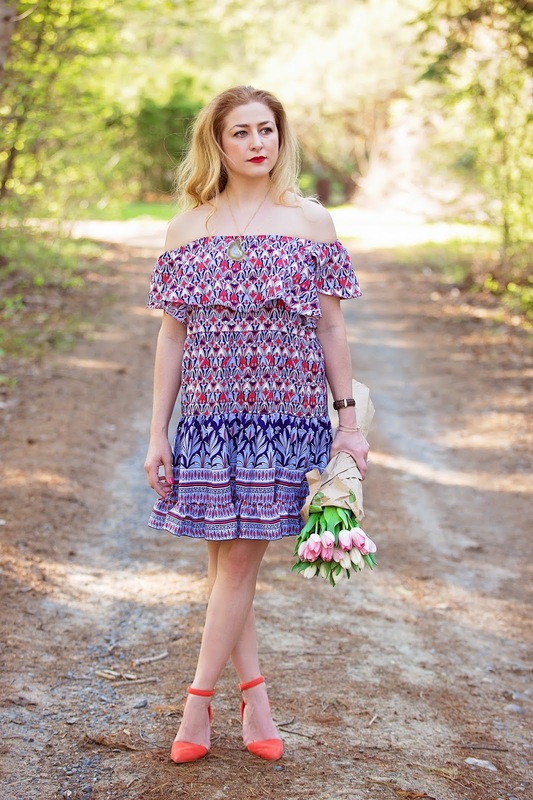 The boho feel, my fav store ASOS and the pic of the pretty flowers! beautiful dress and flowers to match! I love dresses that are cute and girly but still comfy!! This is so cute!! Gorgeous pictures! I love that dress, looks so good and comfortable! This dress is fabulous. I love the off the shoulder and the mix of patterns. Great look! What a gorgeous dress and stunning photos! Beautiful! The dress AND the pics! I don't have a favorite dress right now but I used to! I guess that means I need to go dress shopping! Thanks for sharing at the #HomeMattersParty with us this week! Thanks 4 linking up 2 Top of the World Style. You dress is awesome. Soooo pretty! Thanks so much for linking up with Fun Fashion Friday. I hope your weekend is wonderful! 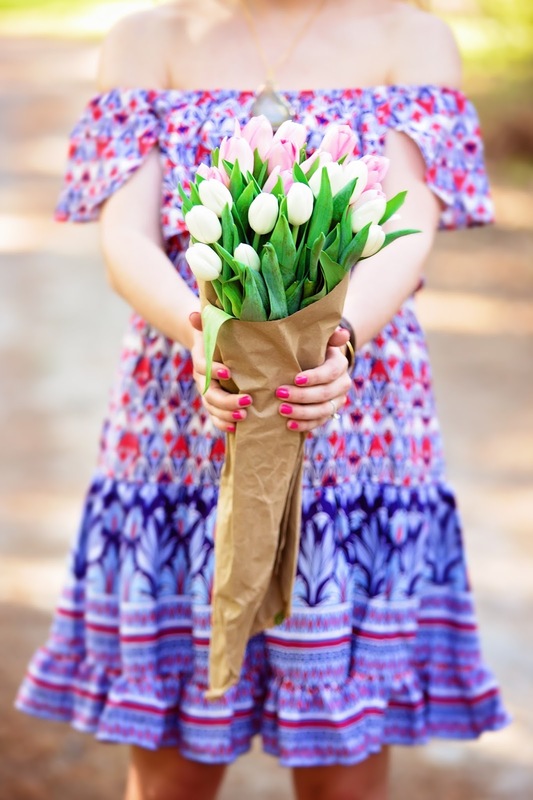 Tulips are my favorite flowers and very pretty dress! Thank you for joining TBT Fashion link up and hope to see you Thursday. Great photos! Great outfit! And your dress looks absolutely adorable! I love the vibrancy of this post! And the flowers give it a cute, delicate touch. I wish it was summer in Australia so I could wear a pretty dress like that!